NO MORE SMELLY WELL WATER! Cabin on 38 acres for the outdoor type. Newly remodeled inside and outside! New heating/AC system. Very comfortable and cozy. The Best Deal on Lake Eufaula! Enjoy the fishing on Lake Eufaula with easy walking access to four coves and two fishing ponds stocked with hybrid bluegill, catfish, bass, etc. Located in a rural environment with plenty of wildlife in the area. A fire ring is out back for having evening campfires and marshmallow roasts. Covered parking available. Walking distance to the lake. Enjoy the most magnificent sunsets you will ever see over the lake from the covered porch! A short drive ( about 10 min.) to Eufaula Marina provides indoor fishing, restaurant, gas for boats, etc. Even closer store, Meirs, for bait, gas, groceries, and a deli for local flavor (At the intersection of wy. 266 and Hwy. 72 about 5 min. away). So if you are the outdoor type that enjoys privacy and quiet you will love staying at Gentry Creek Hunting and Fishing Camp. You will have the cabin and all 38 acres to yourself. Dogs are permitted indoors for pets. Smoking is permitted outside or on the covered porch. Janet and David Humke own properties in Colorado, Oklahoma, and Louisiana that are primarily rural and for the outdoor lovers. They owned an internet business (which is now run by their son) and live 50% of the time in Colorado and 50% of the time in Oklahoma. Just recently "retired" but still have a couple of short term rentals. Check out "Daphne's Mountain Retreat". in Bailey, CO. Search Bailey, CO on youtube. We like the southeast Oklahoma area (Green Country) and especially like the easy access to the lake and the rural environment. 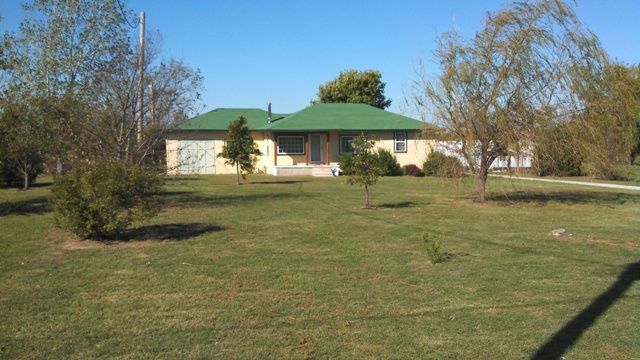 The acreage is beautiful with plenty of grass, trees and view of Lake Eufaula. It is also close to I-40 for easy access, but not so close it interferes with the peace and quiet. Large showers in both bathrooms. Fantastic view of the sunset over the lake from the back porch! A short walk to the lake over a bridge and through the back gate to several coves that are good for fishing. New system installed in 2018. New system installed in 2018 and a backup propane heater if electricity goes out. Couch and several lounging chairs. Fully furnished kitchen with microwave, toaster, coffee maker, and dish washer. Big screen HDTV with 25 HD channels. New covered and uncovered deck. Outside or on the deck. Fishing pond for kids, boat launch near, secluded, private. Bedding (sheets, pillows, etc.) supplied. Great overall experience, worked for what we needed for this event. The house was older but was more than adequate for our event. The accommodations were complete and worked as advertised. The location was perfect for a group a rowdy young men. The only 2 things I could say were not a “highlight” for the trip was the gravel road, didn’t remember seeing that in the discription. This was only a concern for towing my boat but not a deal breaker. The other was the water at the house. It was noted that it is well water and the owners make it clear that bottled water was a must to drink but they didn’t say anything about the smell of the water. The smell was horrible. Almost to the point of making one sick when trying to cook or eat. There were only 2 of the 6 that showered on this stay because the smell was so bad. Again, I understand rural locations are typically on well water but this water smell is very over powering. This unfortunately, is a deal breaker for me. I will not stay there again for that single reason. I’m a hunter/fisherman and I’ve smelled the worst the two sports offer at points but this was even uncomfortable for me. This was a group of 6 men, I couldn’t even imagine if our female companions were on this trip, we wouldn’t have stayed at all. Everything else was perfect and we really enjoyed our stay, other than the water smell. We loved our stay! 2 ponds and access to Lake Eufaula. Cabin was great! Cold AC, lots of room! Great grilling and porch sitting was had by all! Book with confidence! You won't regret it! A hidden gem! Very peaceful. We enjoyed ourselves. The kids loved it. And my mothernlaw didn’t want to leave. Thank u for letting bring our dogs. Great for ONLY the weekend! We had a great time getting away from it all. It was a comfortable stay, lots of property for the dogs to sniff on. Only 2 things i did not really care for with this stay was 1st thing being an old yard care owner, the grass should have been cut before we got there, and the path to the pond and lake were non existent because of this. The 2nd thing is the well water, which usually isnt a bad thing but in this case it was sulfer well water so it stunk terribly. There was no way i was using the water. The owner did warn us of the well water just not the sulfer smell. He advised we take bottle water only after we realized why. Overall it was a great time and loved the pets coming with us. My son even caught his first fish there. I probably would go back there, just better prepared for showers. Very nice home for the price. Access to the water. Lots of room to explore. Hunters and fishermen will love it. Nice rooms in the house. Lots of room for the kids to run around. It’s an older home. Far enough from civilization to get away, but 10 minutes from Walmart and bait store if supplies are needed. Fishing on Lake Eufaula for crappie, bass, catfish, and more. Hunting for dove, ducks, geese and guides for wild boar available ($200 per person). Fishing guides available for additional fee. The full rate of $175 per night is required for Memorial Day weekend, Independence Day, and Labor Day weekend. There is also a three night requirement on those holidays.